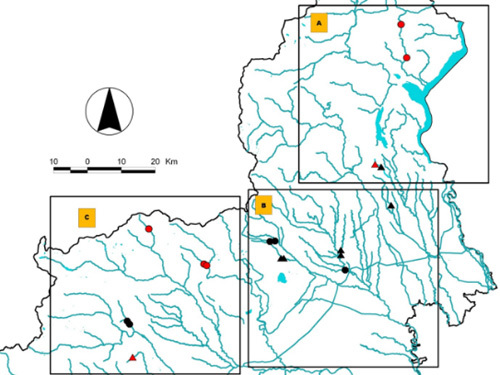 Selected river stretches must represent different habitat conditions or peculiar morphological alterations. At least 2 reference sites are included per river type. Sites cover a wide gradient of morphological alteration, from non-impacted to heavily impacted sites. In order to highlight the effects of habitat conditions, selected river reaches are not affected by severe water pollution (ideally, no water pollution should be present). In order to put in evidence the habitat gradient, ‘couples’ of sampling stations have been selected. The two stations of the couple are positioned at close distance on the same river reach and show obvious differences in habitat features, with the same water quality. 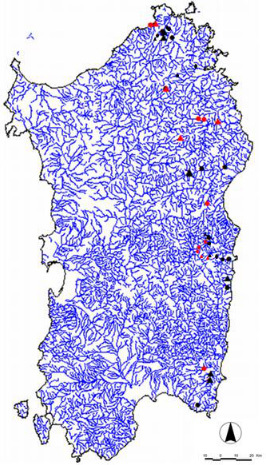 Investigated water bodies location in Sardinia (rivers). Red dots: reference sites. Triangles: nutrient addition sites. (from Deliverable Pd2, mod.) Investigated water bodies location in Piedmont (rivers). Red dots: reference sites.